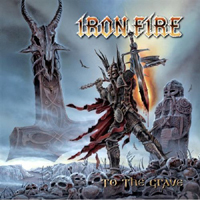 Danish metal band Iron Fire have been around since 1995 and Into The Grave is their 5th album to date. So they are not quick to bring albums out, which, you would think would give them plenty of time to write some killer songs… But to me, I have heard this all before and done better. Iron Fire deliver good Melodic/Power Metal (my favorite genre) offering everything a power metal album should contain, battles, demons, swords & fast paced songs, sometimes a bit over the top. The down side of Into The Grave is Martin Steene’s vocals, they have a real love or hate side to them. And they just annoy the crap out of me, Sorry. There is some really good tracks on this album like “Kill For Metal” I can see 60,000 crazy people chanting this at festivals all over Europe “The Kingdom” “Hail To Odin” and “March Of The Immortals” just to name a few. But nothing really new here, this will appeal to only true power metal fans that buy anything that comes out in this genre. I have given Into The Grave a very fair listen but the only stand out tracks are the ones that I have mentioned and the rest of this album is very forgettable.